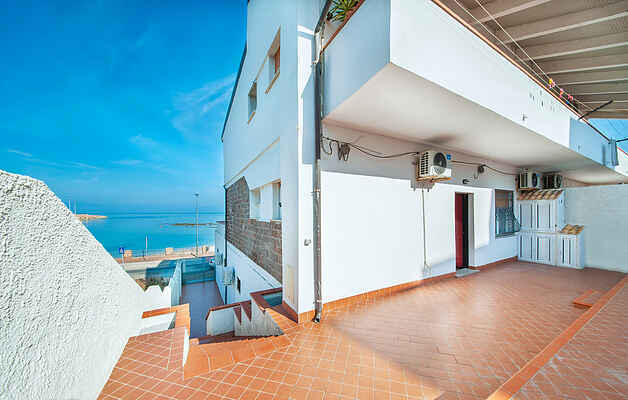 A beautiful and large terrace overlooking the sea of Porto Torres is the peculiarity of this beautiful apartment on the seafront, practical and functional, near the beaches and all services. In the same complex are also IGG078 and IGG079. Porto Torres is a town on the north-west coast of Sardinia, in an area known for the beauty of its coastline and its excellent sea connections, making it one of the most important access points of the island from France, Spain and Genoa. It is located on the Gulf of Asinara, home to the Natural Park of the same name and the Marine Nature Reserve. This area of the island has a long history, from the Neolithic to the Phoenicians, from the Romans to the Spaniards, who shaped the area and left very interesting historical, architectural and archaeological sites. The prehistoric site of Su Crucifissu Mannu or the Roman Domus of Mosaics are definitely worth a visit. There are also ancient gastronomic traditions that you can get to know at the many festivals that take place during the spring and summer months, such as the fish festival, or typical music events and of course the sailing regattas held in good weather and attracting sailors from all over Lure Europe. Do not forget the beautiful island of Asinara, which has become a nature reserve since several years and offers breathtaking views and crystal clear waters. Sassari is about 20 km away, Alghero about 40 km.